I’m so excited to share this blog post with you! It’s an excerpt from an amazing book, Find Your Way, by my friend Carly Fiorina. Carly is a dear friend and valued partner, and I know her insights in this post will help you unlock your potential to become the leader you’re meant to be. Find Your Way is available in stores today, and you can purchase your copy here. 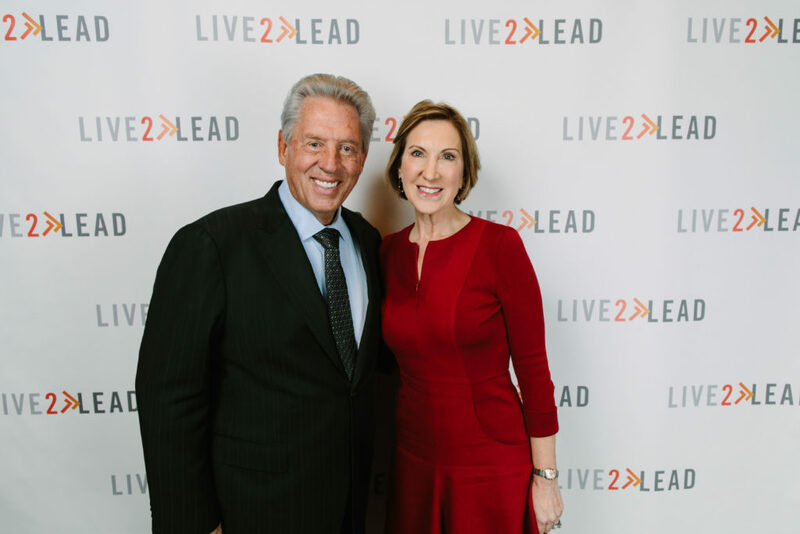 Carly Fiorina and John Maxwell at the Live2Lead event in 2018. It’s natural to fall into a rut from time to time, where we wonder what we’re doing, where we’re going, and how it will all pan out in the end. Not knowing what to do, we snap our fingers and hatch a plan. We focus on that “one thing” – whatever it is – convinced in our hearts and minds that it will get us going again. The dirty little secret of a “destination mindset” – of living life on plan – is that it fails to deliver what it promises every time. For people who adopt an on-plan approach to life, there are only three outcomes – each devastating in its own way. You get there, but you can’t sustain it. Some destination-minded people arrive at their goals – the title, the office, the salary – but are unable to maintain the measures of success they sought so desperately. A high-level executive I know, who worked for more than two decades to earn the title of CEO, comes to mind. He knew at 28 that he would reach his goal and, to his credit, he eventually did. But he had bulldozed his way to the top, so his senior team didn’t respect him, his staff barely knew him, and the company’s board couldn’t hold him accountable. Within three years, his grand dream had turned into a nightmare and he was cut loose. When you hyper-fixate on a destination, you might indeed succeed at doing what you always wanted to do. But what kind of person will you be once you arrive? I’ve seen it time and again: The depth of integrity required to sustain a position of influence in any context is often shortchanged by compromises made on the way up. You get there, but it can’t sustain you. We think there’s a tremendous there there, at the height where we’ve set our heights. Yet, soon after our glorious arrival, we find we’ve been duped. You never get there at all. And of course, there is the possibility that, despite your work and struggle and striving, you just won’t get there at all. And then you have committed yourself to feeling despair because you have not achieved the one thing that you thought would bring you fulfillment, joy, and satisfaction. I know about this on-plan life firsthand. When I was younger, I believed that I, too, simply needed to reach a destination to find happiness. I was a classic, people-pleasing middle child and I found myself enrolled in law school – a place that turned out to be absolutely wrong for me – to please my father. But I realized, after one too many migraines and unhappy nights, that I couldn’t hang my hat on that destination. Since then, I have tried to find my way not by setting my mind on a destination, but by living my life on the path. I have run to the problems in front of me and I have worked to unlock the potential of those around me. In my new book, Find Your Way, I talk about how to find peace, joy, and fulfillment by setting yourself free from the destination mindset and instead living life on the path. Find Your Way is available today. The people around you may raise an eyebrow or two when you begin to find your way. When you get this reaction, my advice is to keep on keepin’ on. Remind yourself that you can suffer some tough blows without getting completely knocked out. In fact, you can gain strength and wisdom, and even be blessed by those tough blows. You can endure all the twists and turns in the road without becoming disoriented or distraught. You really can live in such a way that the twists and turns won’t flatten you; in fact, they will fuel your journey. You can find your way and never lose it again. Find your way closely resembles a book I am working on. The book is growing so that we can go places. Carly clearly tells us that it is not about the destination. We may get to a place only to find it wasn’t interesting at all. Find your way is about destiny rather than destination.